A visit to Baguio City, north of Manila, won't be complete without a brief stop at Good Shepherd Sister's place to buy ube jam (purple yam), peanut brittle, strawberry jam and other goodies as pasalubong to loved ones back home. Some time ago, the sisters opened a "sister" store in the mountain city of Tagaytay, closer to Manila, and made available the famous pasalubong of the former hill station of the Americans to Metro Manilans who frequent the city overlooking Taal Volcano. After the sidetrip, the tired "slaves" had dinner of crispy tawilis, grilled maliputo, bulalo etc at Kaye Ryan Grill restaurant near the new Tagaytay Econo Inn. Bahay Pastulan is on a narrow alley very near kilometer 61 of the highway about a kilometer away from Picnic Grove. A sign that says Maryridge will point the way to the single-lane street. The original Good Shepherd Convent in Baguio is located on Gibraltar Road, Mines View Barangay (walking distance from the souvenir shops of Mines View Park). 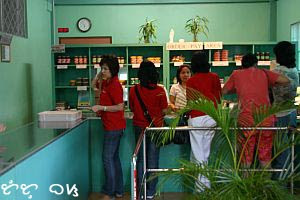 They also sell fruit preserves, strawberry jam, cashew and peanut brittle, and coco jam. havent had the dimples before; in fact tis my first time to hear of it. it makes my mouth water. haha ang cute naman nung ube dimples. ngayon ko lang nakita yan. better check that out when i go to baguio this new year. I love ube! And the ube dimples are making me hungry, they look really tasty! Hey you really make the stuff sound good. I like jam from time to time. But fruit, don't like the stuff that contains far too much sugar. woot. i really loveee ube!! 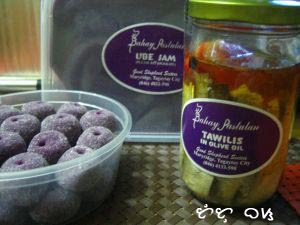 I haven't tried ube jam. I must have some of this next time I go to a Pinoy store. i LOVE good shepherd's ube jam! real winner. hehe kakamiss! ube dimples?! that's sumthin new. what a coincidence! at around the time of this entry of yours, i had tasted ube from tagaytay. baka ito yun. dave, if the label says Bahay Pastulan, then that's the one! sarap no? 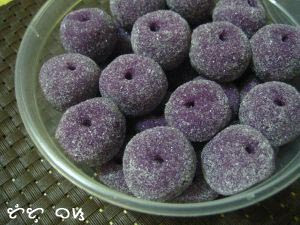 i love ube... my God! what is the address in tagaytay. thank you. i'd like to ask... How come you didnt include Batanes in the list of Philippine provinces? Have always been eating dimples when I was living in Tagaytay. im always in tagaytay but i didnt know that they have a good shepperf in tagaytay thanks for this site. i will visit the place next week.